This section is designed to give health professionals especially homoeopaths quick access to a range of useful health and homoeopathic information. 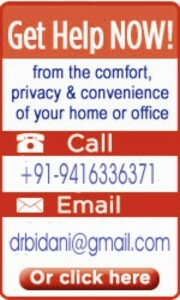 Dr. Navneet Bidani has written several health-related articles and information and his articles have appeared in a wide variety of publications and newspapers, including Australian Journal of Homoeopathy, British Homoeopathic Journal, National Journal of Homoeopathy, The Homoeopathic Heritage etc. He is an editor for South Delhi Homoeopathic Association’s bimonthly homoeopathic journal – The SDHA Chronicle. Dr. Navneet Bidani offers you his articles to reprint or repost – FREE – provided that his name and contact information (supplied at the end of each article) are included. Please let us know how you plan to use any article(s) by contacting us by email or by phone at: +91-9416336371.